I’ve had a busy morning! First, I deep-cleaned my bedroom. Then I hoovered (that’s Brit-speak for “vacuumed”) the entrance hall. And finally, because I craved something delicious and exotic to eat, I made a batch of Buttermilk Buckwheat Pancakes. Buckwheat flour, if you’ve not yet made its acquaintance, is a super-food. It’s rich in protein, fiber, and B vitamins. It’s gluten-free, too. The nutty-flavored flour is simply the ground up seeds of the buckwheat plant, which goes by the unfortunate botanical name Fagopyrum esculentum. 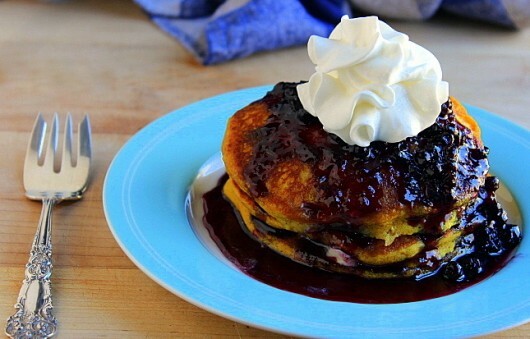 Use the flour for pancakes, and you won’t be sorry. Well, you might be sorry if you eat every last pancake all by your lonesome. 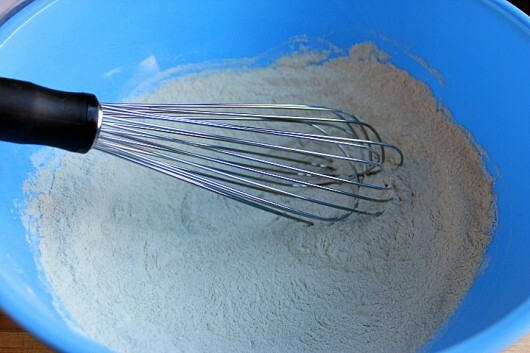 Using the Valentine’s Day gift you received from your wacky but wonderful mother, tip 1 cup of buckwheat flour into a medium-size mixing bowl. And a wee bit of salt. 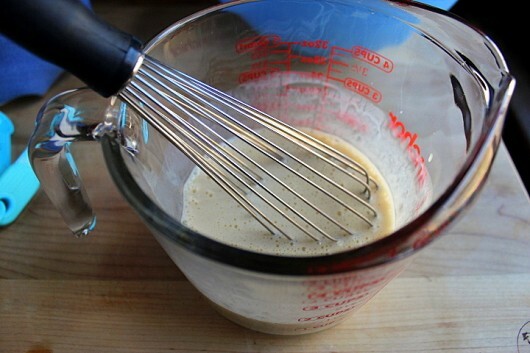 Whisk these dry ingredients together. Are you paying attention? I certainly hope so. There’s no room for levity here. Ah, levity. In the early 1970s, my mother placed a bumper-sticker on her car. Shall I tell you what it said? I brake for Jayne Mansfield’s head. After you’ve googled Jayne Mansfield, pour 1 1/4 cups of well-shaken buttermilk into a separate bowl. And 1 teaspoon of pure vanilla extract. Then go to town with your wire whisk. And whisk or stir only until combined. 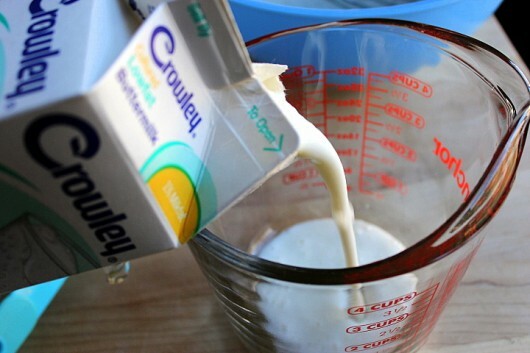 Since the buttermilk is acidic, and the baking soda is pure alkaline, the mixture will bubble rather furiously. Don’t say I didn’t warn you. Ladle, by the 1/4 cupful, the batter onto a greased and preheated griddle, frying pan, or electric skillet. If you are using an electric skillet — I have this one — set the temperature to 325°F. 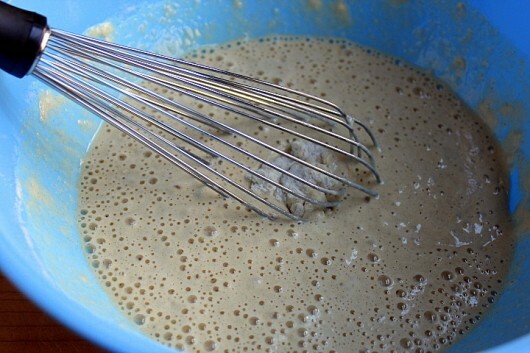 When the edges of the pancakes look dry, flip them over, and brown the other side. And a ridiculous amount of wild blueberry preserves. 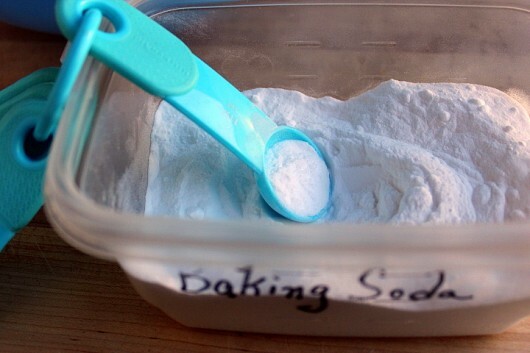 You can add some of this stuff, too, providing you’ve already cleaned your bedroom and vacuumed your entrance hall. Think you’ll give these BBPs a try? You can let me know by posting a comment. As always, your words are the sunshine of my day. 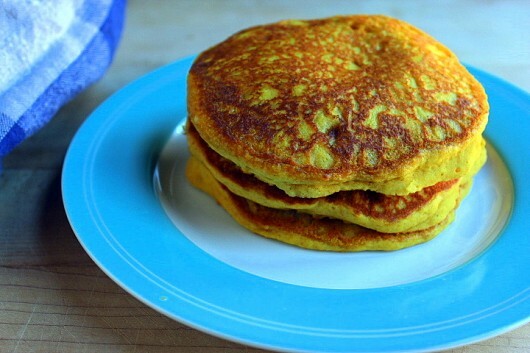 These buckwheat pancakes are loaded with protein, fiber, and B vitamins. Serve them with butter and maple syrup for breakfast or brunch, or top them with wild blueberry preserves and whipped cream for dessert! Grease and preheat a large frying pan, a griddle, or an electric skillet. 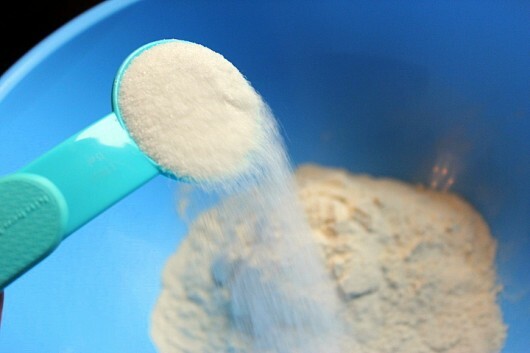 In a medium-size mixing bowl, whisk together the flour, sugar, baking powder, baking soda, and salt. 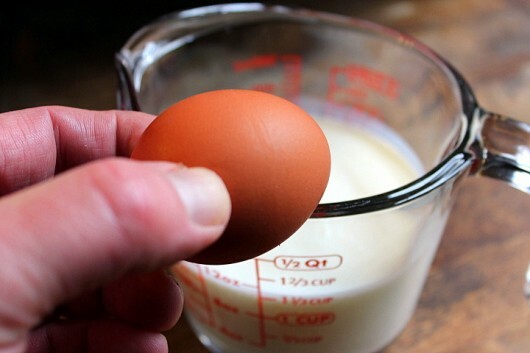 In a separate bowl (a 4-cup glass measure is ideal), whisk together the buttermilk, egg, and vanilla. 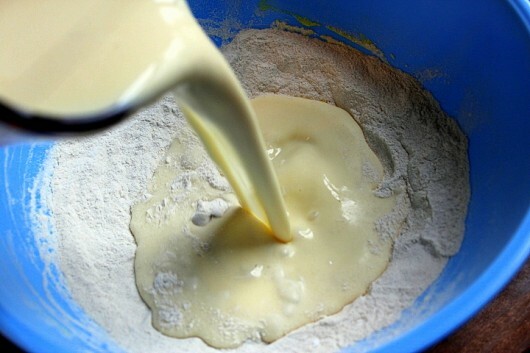 Add the wet ingredients to the dry, and whisk or stir just to combine. The mixture will be thick and bubbly. Ladle, by the 1/4 cupful, the batter onto the hot skillet. 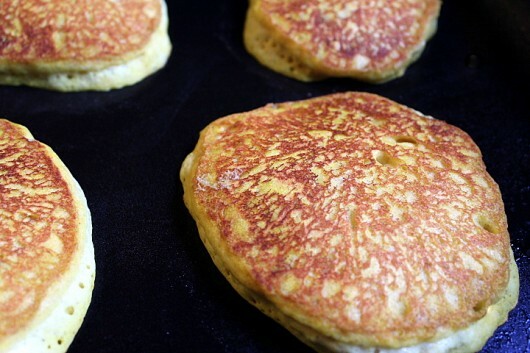 Fry until the edges look dry, and then flip the pancakes over to brown the other side. 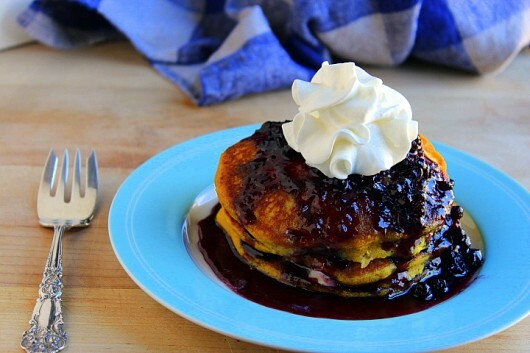 Serve with butter, pure maple syrup, wild blueberry preserves, or anything else that happens to float your boat. I’m still laughing about the bumper sticker. Crude but funny. I guess in comparison to today’s zombies it is kind of mild 🙂 I have to get some buck wheat flour first. These sound yummy! I will make these! And I will add some bacon. Peter’s got the right idea! I’m thinking that with all that blueberry preserve and whipped cream even your shoe might taste good. I’ve grown buckwheat many times, but only as compost fodder or green manure. I’ve never let it ripen. Maybe I should. Love that cup measure! Your mom can adopt me anytime. Your mom’s a hoot. Obviously. These cakes look aMAZing! I cracked up over the bumper sticker and I didn’t have to Google Jane Mansfield either!! Pancakes look yummy! Need buckwheat flour first! Love ya Kevin!! All that housecleaning this morning already !! I’m still on the coffee. The pancakes look wonderful however. I’ve got blueberries in the fridge . . . got me thinking. What a lovely surprise to see buckwheat as the star of the show this morning!! For at least 3 generations my family have savoured sourdough buckwheat pancakes. Our tradition is to enjoy the first batch of the year on Christmas morning and carry on enjoying them pretty regularly throughout the winter season. 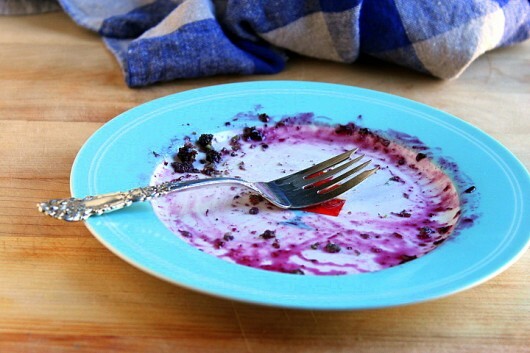 This year, after many, many delicious mouthfuls, I regretfully ended my winter deliciousness. My waistline was suffering!! I’ve had a horrible flu. These look wonderful. I think I have a reason to keep living. These look so good Kevin! I see i refused to address the cleaning my bedroom first part. !bah humbug . Hi Trudi – Buckwheat flour is definitely gluten-free. 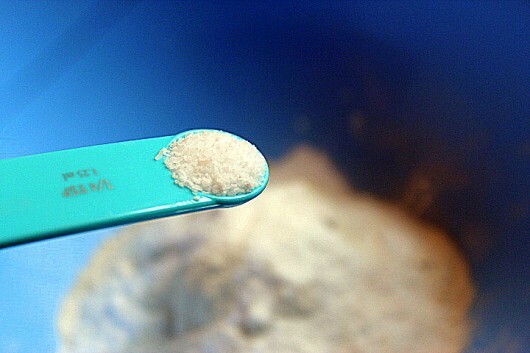 The plant from which is hails isn’t related botanically to wheat. Don’t worry about your bedroom. I’ll never tell! I love buckwheat pancakes. I haven’t made them in years. Thanks for the reminder, Kevin. I had a zany mom, too. I have so many memories of all the fun stuff. We are lucky. Ah, the memories of one of my favorite childhood comfort foods!! My Mom made buckwheat pancakes for us on Saturday morning. I always loved them slathered in lots of butter and just a drizzle of molasses. I am going to make these. It is so nice of you to share the recipe!! Yum. My family thinks you are member of the our family. Uncle Kevin recipes are the best! Your mother’s a hoot! I bought buckwheat flour and buttermilk this morning, and then made the pancakes. THEY’RE GREAT! So easy and so delicious with butter and jam. My new go-to pancakes. Hubby loved them, too. I can’t imagine doing all that energetic cleaning and vacuuming before breakfast! Can’t quite tell from the photo but your silver fork looks like Gorham’s Buttercup pattern. In your upcoming cookbook, you could name your recipe: “Buttercup and Buckwheat!” ha. 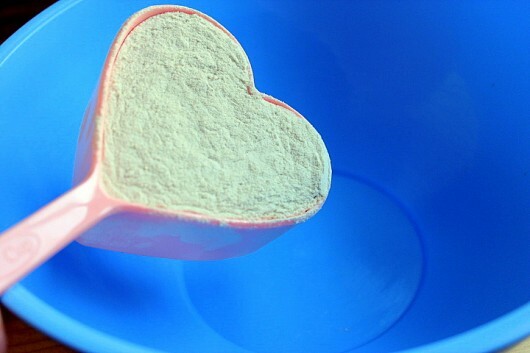 Your heart-shaped measuring cup is almost as cool as your favorite blue spatula. Kevin, I love everything you post—you make everyone feel like we are your personal friends. It is truly like visiting a dear friend when I open your blog and see pictures of your garden, the yummy food pictures and recipes, the rooms of your home. Thank you so much for sharing with so many total strangers. I also remember Jane Mansfield’s unfortunate accident, ugh. Your Mom must be a hoot! Many blessings for you in 2016. This will be my dinner tonight! I just cleaned my house and sooooooo deserve these! Hi Catharine R – Thanks for the review! Hello Kevin, I like your style too, you make me feel as if we are friends. You turn ordinary events like bedroom cleaning into jovial pastimes. Love your heart scoop. I am out the door to buy buckwheat. ❤️ Luv ya! Lillian. Kevin, I was under the impression that buckwheat flour, although it is wheat-free, it is not entirely gluten-free. You might want to research this if you haven’t already. 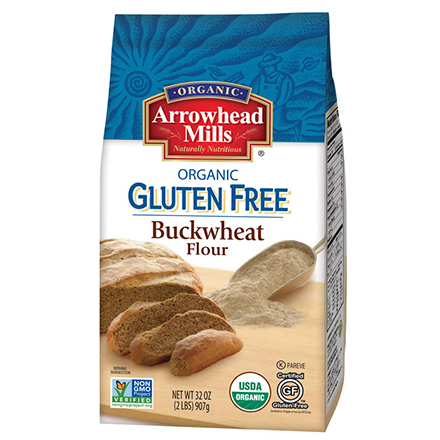 I like things made with buckwheat and I remember being disappointed when I learned that it wasn’t gluten-free, as I am gluten-intolerant. 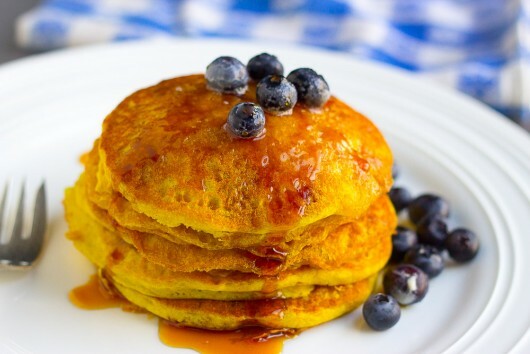 Hi Naomi S. – Buckwheat flour a/k/a “kasha” a/k/a delicious-for-pancakes is 100% gluten-free. More details from celiac.com. I am old enough that I did not have to Google up Jayne Mansfield. I also adore the heart shaped measuring cup, and I have also heard of buckwheat honey. My husband is the official pancake maker around here so I will make sure he sees this lovely set of instructions. Even the fork is beautiful !! 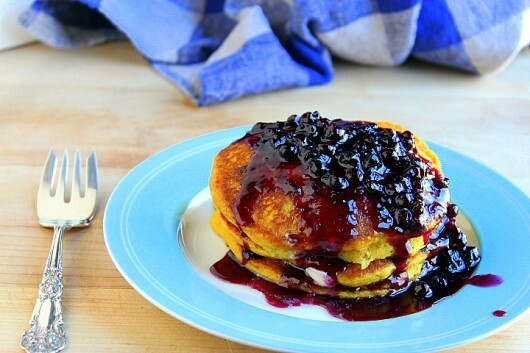 I want to make these delicious looking pancakes as soon as I can get some buckwheat flower. Thanks for all of the extra info about buckwheat flower. I always learn something new when I visit your website. Oops, I will get buckwheat flour, not flower, as I had wrote. Ha Ha = ) I’ve got gardening on my mind too. Julie R – Well, if you can get your hands on a buckwheat flower, then you can grind its seeds to make buckwheat flour! Glad to see you chose organic flour. The even better choice would have been Farmer Ground buckwheat flour. They stone grind grain grown in the Finger Lake area of New York and their flours are simply fresher, more carefully ground and unsurpassed in flavor. I notice you used old school vanilla. Try some Beanilla vanilla and maybe add some vanilla beans to the mix for a truly gourmet result. If you separate the egg and beat the white til stiff, you’ll get even fluffier pancakes without having to add so much baking powder and soda. Oh and organic cultured butter is the way to go…. Other than that, you’re on the right track. I had forgotten how much I love buckwheat pancakes. 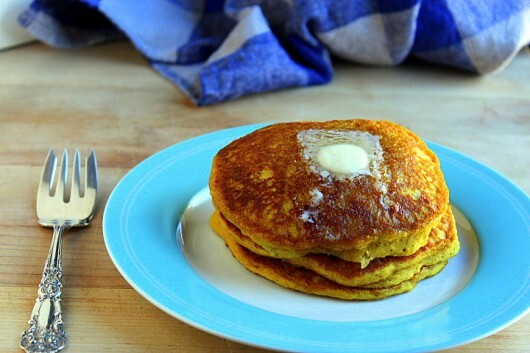 The first time I ever ate buckwheat pancakes was in Yellowstone, Wyoming years ago. Now I have the flour from our health food store I can love these pancakes again. 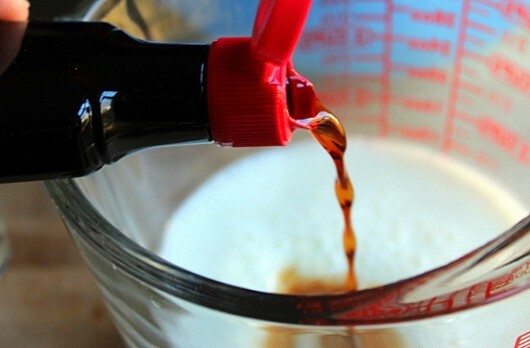 Just bought a bottle of this years cane syrup from our farmers market and LOVE it on buckwheat pancakes. Thanks for a great recipe! Do you know if pancakes can be frozen? I live alone and have always thrown out any extra pancakes. The crows love them but I hate throwing out food……even for the crows. I usually cut the recipes in two but don’t know how to cut an egg in half. Anyway, I am going to make these for myself and the crows if I have to. 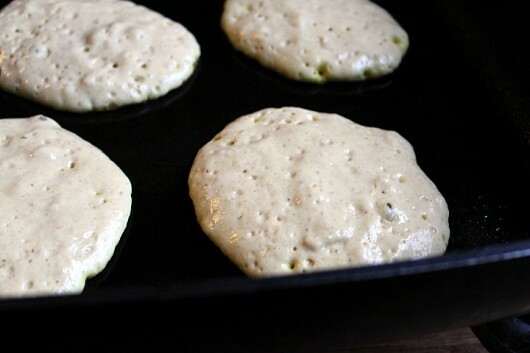 Hi Flora – When sealed in zip-lock bags, these Buttermilk Buckwheat Pancakes will freeze very well. Wrap in paper towels before reheating in the microwave oven. To reheat in a traditional oven, wrap loosely in aluminum foil. Enjoy! How ironic that you were “Hoovering” , and then later used an electric frypan for your pancakes. My electric frypan is a copper-colored version made by , you guessed it, the Hoover Corporation. And the #1 thing I use it for is to make pancakes !! I got it for a wedding present almost 42 years ago. I had never seen one like it before and I haven’t seen one like it since ! !